Growing scientific evidence indicates that animals do indeed have knowledge of natural medicines. In fact, they have access to the world’s largest pharmacy: Mother Nature herself. Zoologists and botanists are only just beginning to understand how wild animals use plant medicines to prevent and cure illness. Birds, bees, lizards, elephants, and chimpanzees all share a survival trait: they self-medicate. These animals eat things that make them feel better, or prevent disease, or kill parasites like flatworms, bacteria, and viruses, or just to aid in digestion. Even creatures with brains the size of pinheads somehow know to ingest certain plants or use them in unusual ways when they need them! There’s A Name for It! The science of animal self-medication is called zoopharmacognosy, derived from the roots zoo (‘animal’), pharma (‘drug’), and gnosy (‘knowing’). Zoopharmacognosy studies focus on how animals use leaves, roots, seeds and minerals to treat a variety of ailments. Indigenous cultures have had knowledge of animal self-medication for centuries; many folk remedies have come from noticing which plants animals eat when they are sick. But it is only in the last 30 years that zoopharmacognosy has been scientifically studied. Biologists witnessing animals eating foods not part of their usual diet, realised the animals were self-medicating with natural remedies. Many animal species have created their own pharmacies from ingredients that commonly occur in nature. An example of animals’ self-medicating prowess is provided by elephants that make pilgrimages to a cave complex at Mount Elgon, an extinct volcano in western Kenya. They dig out the soft rock in the cave walls, grind and then swallow it. And the reason? Sodium is a vital ingredient in stimulating bodily defences against toxins that major herbivores will encounter in many of the plants they eat. Not only do many animals know which plant they require, they also know exactly which part of the plant they should use and how they should ingest it. 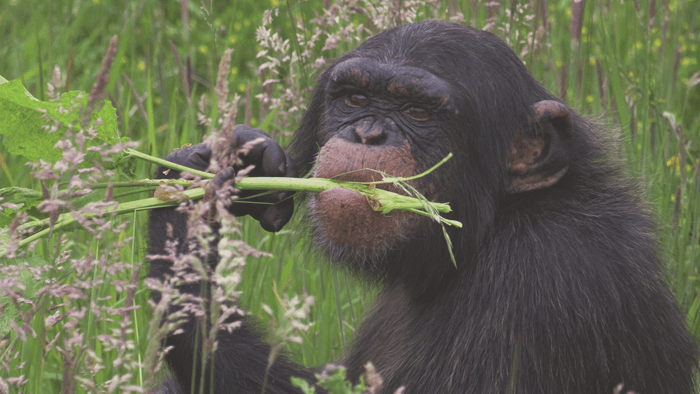 Chimpanzees in Tanzania have been observed using plants in different ways. The Aspilia shrub produces bristly leaves, which the chimps carefully fold up then roll around their mouths before swallowing whole. The prickly leaves ‘scour’ parasitical worms from the chimps’ intestinal lining. The same chimps also peel the stems and eat the pith of the Vernonia plant (also known as Bitter leaf). In bio-chemical research, Vernonia was found to have anti-parasitic and anti-microbial properties. Both Vernonia and Aspilia have long been used in Tanzanian folk medicine for stomach upsets and fevers. It is only the sick chimpanzees that eat the plants. The chimps often grimace as they chew the Vernonia pith, indicating that they are not doing this for fun; healthy animals would find the bitter taste unpalatable. Some species of South American parrot and macaw are known to eat soil with a high kaolin content. The parrots’ diet contains toxins because of the fruit seeds they eat. (Even the humble apple seed contains cyanide.) The kaolin clay absorbs the toxins and carries them out of the birds’ digestive systems, leaving the parrots unharmed by the poisons. Kaolin has been used for centuries in many cultures as a remedy for human gastrointestinal upset.